Prof. Nelson Sewankambo is a professor of internal medicine and former principal of the College of Health Sciences at Makerere University. Prof. Sewankambo was among the first scientists to publish data on AIDS in Africa. He was instrumental in starting the AIDS Clinic at Mulago Hospital in Uganda, and continues to be active in HIV/AIDS research. Prof. Sewankambo is currently co-principal investigator (Co-PI) of the Rakai Health Sciences Program. He was founding director of the Clinical Epidemiology Unit, and Co-PI of the Behavioral and Qualitative Research on AIDS Prevention funded by the Canadian International Development Research Centre. 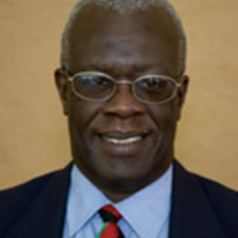 He has served on numerous local and international advisory boards including the Working Party on the Ethics of Clinical Research in Developing Countries of the Nuffield Council for Bioethics, the Joint Learning Initiative, the WHO African Advisory Committee on Health and Research Development (AACHRD), and the Board of Directors of the International Clinical Epidemiology Network (INCLEN). Prof. Sewankambo is also the chairman of the Infectious Diseases Institute Board, a member of Council of the Global Forum for Health Research, and a chair of Initiative for Strengthening Health Research Capacity in Africa.